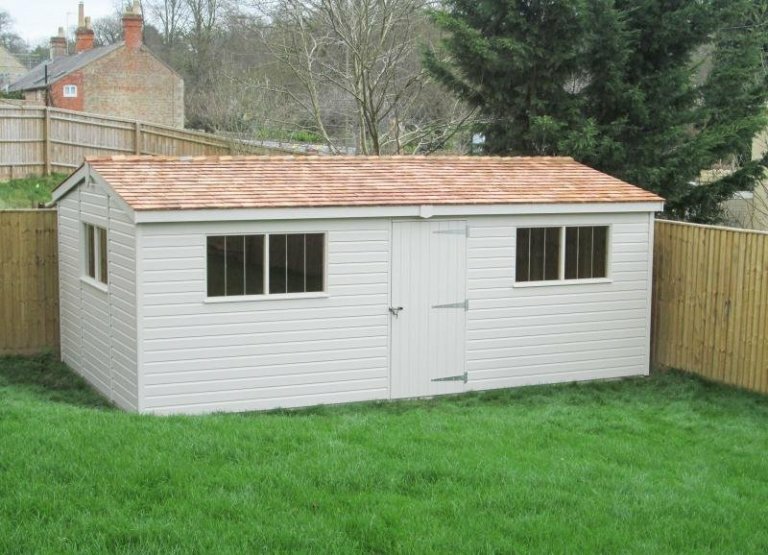 This large Superior Shed is 3.6 x 6.0m in size, and it has been installed in our customer’s garden in Bladon, Oxfordshire. This is a new house they’ve moved into, and they’ve gone from having a house with a double garage, to a house with no garage, so this will be a necessary storage facility for them. To help sort out the storage items they’ve got, they have split their shed into two rooms with the help of a partition and an internal door to access the second room. The larger room is 3.6 x 3.6m in size, with access via the external door, and the smaller room is 3.6 x 2.4m in size, with access via the internal door. 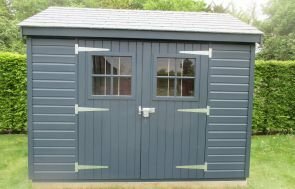 Cedar shingle tiles have been used to protect the roof in an attractive manner, and the shed has been painted in Twine, which is a neutral colour from our Valtti Paint Range. There are six windows in total around the shed to allow enough natural light inside to see by, and the customer also wanted a security pack to keep everything safe, which consists of a seven lever lock and heavy duty sliding bolt, security screws on the door hinges, and stainless steel window bars. For more information on our Garden Sheds, please call us on 01760 444229 to discuss your requirements with our helpful team, or come and visit our Burford Show Centre to see our extensive range for yourself.